Accounting is a field that is utilized by almost each of us in different perspectives for diverse usages. In terms of business use, accounting holds immense significance as it forms the basis for any organization to work systematically and keep an effectual track of expenses and income sources for the management. The accounting team is responsible for checking the health of the business and works in an integrated manner to check inventories, stocks, supplier details along with maintaining tax and investment related procedures. Computer systems have made it extremely simple for the users to manage and update the desired procedures for the organizations. Ezi Accounting 1.90 is a utility that helps the users to easily manage the accounting needs and also offers some practical controls for managing expenditure and earnings. Ezi Accounting opens with an organized and neatly arranged interface with the main options placed at the top panel in the form of vivid icons and the main screen displaying the list of tasks and details along with varied other information pieces for client and user advantage. The basic look of the interface is quite bright and colorful and makes navigation simple and pleasurable for the user. This program is a low cost and easy to use application and invoicing program for all kinds of businesses. The availability of its interface in multiple languages like Arabic, French, and Portuguese besides English makes it even more customizable. Various functions such as client statements, sales analysis, purchasing and stock makes it a preferred tool for all with all integrated functions for tax set ups that can be localized. To conclude, Ezi Accounting 1.90 easily earns rich kudos for its user friendly and enhanced working and hence gets a rating score of four points for its impressive performance and simple yet powerful working. Ezi Accounting is a low cost easy to use accounts and invoicing program for small to medium sized businesses. Used widely in many countries. 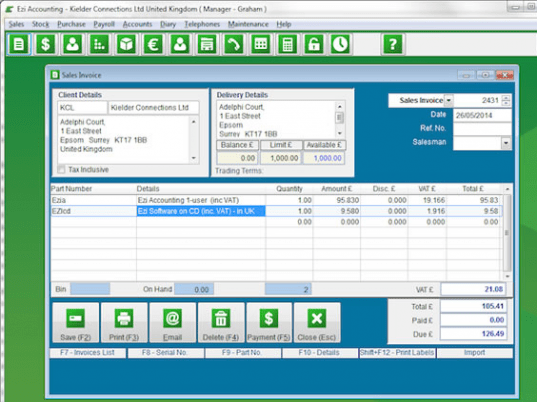 Featuring a simple user interface with multiple security levels, this is a low cost accounting solution with no annual licence fees when purchased, or for rental. Available boxed or as a download with a free 90 day full function evaluation. Options are available for rental or purchase. Standard accounting functions include Invoicing, Quotations, Debtors Control, Inventory and Stock Control, Clients Details and Statements, Sales Analysis, Clients Statements, Aged Clients, Purchasing / Purchase Orders. Reports include Purchase Analysis, Stock Analysis, Bank Reconciliation, Assets, Liabilities, Equity, Income, Cost of Sales, Expenses. Ezi Accounting allows currency, tax, set-up and forms to be localised to suit many countries. Payroll can be configured to support local needs. Ezi Accounting can be customised for operation in many countries in Africa, Asia, Europe, Middle East, North and South America. Currency, taxes (one or two) and setup can be localised to suit most countries. Menus can be downloaded and installed in Arabic, Chinese, Dutch, French, Portuguese, Spanish. This allows operation in most countries in Africa, Caribbean, Europe, Middle East, North America, South America. Upgrades to multi-user allow Ezi Accounting to expand with your business. Point of Sale features and support of POS hardware can be added by upgrading to Retail Man Point of Sale.